White House senior adviser Jared Kushner, Donald Trump Jr. and former campaign chairman Paul Manafort are scheduled to testify next week. Three Trump campaign advisers who attended a previously undisclosed meeting with a Russian attorney are now scheduled to testify before two Senate panels. The attorney for President Donald Trump's son-in-law and senior adviser Jared Kushner confirmed to multiple outlets that Kushner will testify before the Senate intelligence committee on July 24. It is expected to be held in private. Donald Trump Jr. and former Trump campaign chairman Paul Manafort are scheduled to testify publicly before the Senate judiciary committee July 26. But Politico reports Trump Jr. and Manafort just received the panel's request Wednesday. As of Wednesday evening, the two hadn't confirmed they'd attend. Kushner, Trump Jr. and Manafort have faced scrutiny recently for a meeting they held with a Russian attorney in June 2016. Trump Jr., according to his own emails, had been told the lawyer was a "Russian government attorney" who had incriminating information about Hillary Clinton. The information was described in an email to be part of the Russian "government's support for Mr. Trump." The attorney denies working for the Russian government and said she didn't have any information about Clinton. It has since been reported that more people attended the meeting than Trump Jr. disclosed last week. The Associated Press was first to report a lobbyist who is said to have ties to Russian intelligence was in the meeting. 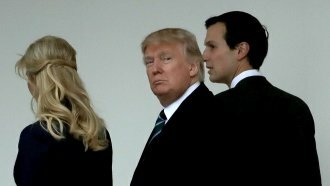 News of the meeting reignited calls from Democrats to revoke Kushner's security clearance. Kushner had previously faced scrutiny for not initially disclosing his foreign contacts when seeking a security clearance. Last week, The New York Times reported Kushner updated his list of contacts three times and added over 100 names. Among the other witnesses scheduled to appear before the Senate judiciary committee are Glenn Simpson and William Browder. Simpson is the co-founder of Fusion GPS, the company tied to the Trump-Russia dossier that Buzzfeed ended up publishing. As Vanity Fair reported, Fusion GPS was paid to conduct opposition research on then-candidate Donald Trump. It, in turn, paid a former British spy to investigate any ties Trump had to Russia. That former spy authored the dossier. Simpson is also tied to a lobbyist who attended the June 2016 meeting with Trump Jr., Manafort and Kushner, according to ProPublica. Browder lobbied for the Magnitsky Act, named after his Russian attorney, who was killed in 2009. The act is what led Russian President Vladimir Putin to ban U.S. adoptions of Russian children. Trump Jr. said the conversation with the Russian attorney was primarily about adoptions and the Magnitsky Act.